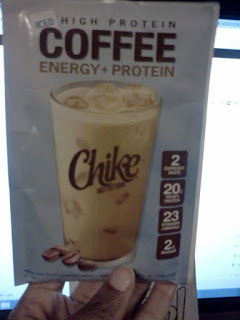 You tempt me with tat's, but then again I already know the awesomeness of this product, love the guys at Chike. I'm interested in checking it out. It would be nice to find a way to combine the coffee love and protein all in one! I would love to try it!!!!!! I'm a coffeeholic! I don't want it - but your review is adorable. Unobtanium and parts from a scrapped 747...HA HA HA! Yum! I want in! I already like their fb page, but going to add a comment and like yours! 2. I shared the contest on my FB tagging you and Chike! Egads it's easier to buy crack than get a free sample of this stuff. I have Tweeted, Facebooked, and blogged. When Networked Blogs hits, it will all get Tweeted and Facebooked AGAIN! Hello. I'm excited. I will so FB you. And read you all the tome..
Im gonna give it a try!! I love me some coffee (prefer mocha) and it has lots o'protein! Way more then "the others". I didnt see where you reviewed with milk I was wondering how that went?